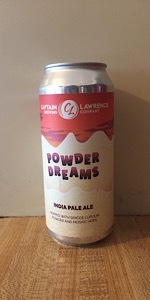 Powder Dreams IPA | Captain Lawrence Brewing Co.
L: Poured from a tallboy can to a pint glass. Had a golden yellow color and a cloudy consistency. There was a half inch of foamy, somewhat long-lasting head. Excellent lacing. S: A very nice aroma of hops, citrus, malt, and tropical fruit. T: Tasted of a bit of malt (mostly in the finish), lots of citrus (lemon peel, in particular), a good shot of hops (present throughout), some lupulin powder (not as prevalent), and lots of tropical fruit (pineapple). An extremely sweet, fruity, and likable flavor. The fruit elements are definitely the stars, but it definitely works. F: A well-carbonated beer with a super creamy finish. Medium-bodied. O: An incredibly enjoyable, easy to drink IPA. Very much drinkable. A: Poured from the can into a Piraat tulip/snifter-type glass. Boyd is hazy but bright orangey-golden with a nice 1-finger foamy white head on top. S: First impression is that it's more "bitter" than expected - think underripe pineapples and pineapple juice, along with some grapefruit pith and lemon peel. Loads of tropical fruit. T: Juicy and sweet - oddly sweet, given my impression of bitterness in the nose. Think sweeter tropical fruit, like papaya. Mid-sip the pineapple and lemony bitterness show up, along with an earthy or herbal hoppiness. ABV is noted as heat at the back of the palate. M: Kind of juicy in feel. Carbonation is modest. O: Solid. Nice nose, but the flavor doesn't quite match up. Though to be honest, the more I drink, the more I like. Powder Dreams IPA from Captain Lawrence Brewing Co.